Titanium is as strong as some steels, but 45% lighter. There are two allotropic forms and five naturally occurring isotopes of this element; 46Ti through 50Ti, with 48Ti being the most abundant (73.8%). Titanium's properties are chemically and physically similar to zirconium. The metal is extracted from its principal mineral ores via the Kroll process or the Hunter process. Its most common compound, titanium dioxide, is used in the manufacture of white pigments. Other compounds include titanium tetrachloride (TiCl4) (used in smoke screens/skywriting and as a catalyst) and titanium trichloride (TiCl3) (used as a catalyst in the production of polypropylene). A metallic element, titanium is recognized for its high strength-to-weight ratio.It is a strong metal with low density that is quite ductile (especially in an oxygen-free environment), lustrous, and metallic-white in color. The relatively high melting point (over 1,649 °C or 3,000 °F) makes it useful as a refractory metal. The metal is a dimorphic allotrope with the hexagonal alpha form changing into the body-centered cubic (lattice) beta form at 882 °C (1,620 °F). The specific heat of the alpha form increases dramatically as it is heated to this transition temperature but then falls and remains fairly constant for the beta form regardless of temperature. Similar to zirconium and hafnium, an additional omega phase exists, which is thermodynamically stable at high pressures, but which may exist metastably at ambient pressures. This phase is usually hexagonal (ideal) or trigonal (distorted) and can be viewed as being due to a soft longitudinal acoustic phonon of the beta phase causing collapse of (111) planes of atoms. The most noted chemical property of titanium is its excellent resistance to corrosion; it is almost as resistant as platinum, capable of withstanding attack by acids, moist chlorine in water but is soluble in concentrated acids. While the following pourbaix diagram shows that titanium is thermodynamically a very reactive metal, it is slow to react with water and air. This metal forms a passive and protective oxide coating (leading to increased corrosion-resistance) when exposed to elevated temperatures in air, but at room temperatures it resists tarnishing. When it first forms, this protective layer is only 1–2 nm thick but continues to slowly grow; reaching a thickness of 25 nm in four years. Titanium burns in air when heated to 1,200 °C (2,190 °F) and in pure oxygen when heated to 610 °C (1,130 °F) or higher, forming titanium dioxide. As a result, the metal cannot be melted in open air as it burns before the melting point is reached, so melting is only possible in an inert atmosphere or in vacuum. It is also one of the few elements that burns in pure nitrogen gas (it burns at 800 °C or 1,472 °F and forms titanium nitride, which causes embrittlement). Titanium is resistant to dilute sulfuric acid and hydrochloric acid, along with chlorine gas, chloride solutions, and most organic acids. It is paramagnetic (weakly attracted to magnets) and has fairly low electrical and thermal conductivity. 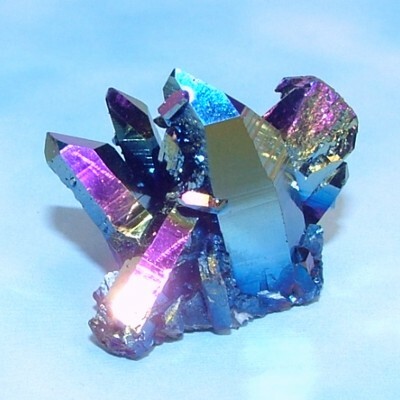 Experiments have shown that natural titanium becomes radioactive after it is bombarded with deuterons, emitting mainly positrons and hard gamma rays. When it is red hot the metal combines with oxygen, and when it reaches 550 °C (1,022 °F) it combines with chlorine. It also reacts with the other halogens and absorbs hydrogen.